UC Berkeley faculty and staff were among those interviewed by In These Times on how "shared services" programs negatively impact public and private universities. Across the nation, writes James Cersonsky, consulting firms like Bain & Company “have found a new foothold for restructuring academic labor along corporate lines.” UCB’s reorganization plan, “Operational Excellence,” has already cost millions in consulting fees, and staff and faculty are increasingly opposing the new structures that are being forced onto those who work in finance, HR, IT, research administration and library services. A growing number of top-ranked colleges are now providing free online courses, including UC Berkeley, which will start offering courses this fall through the web portal, edX. UCB chancellor Robert Birgeneau said he believes it will revolutionize education, but many are wondering whether such courses will ultimately undermine the finances of colleges and universities, much as online offerings have affected newspapers. "The needs of the department do not justify your continued employment." That’s what UC Davis police chief informed Lt. John Pike, the UCD police officer involved in the notorious pepper-spray incident at UC Davis last November. In firing Pike, the police chief overrode the recommendations of an internal affairs panel that issued a report on the widely publicized incident. 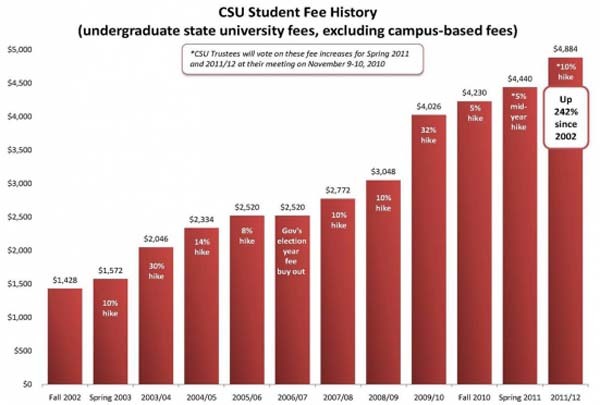 As the LA Weekly pointed out last week, there couldn’t have been a worse PR combination than the July meeting of the Cal State trustees, when they discussed a 5 percent tuition increase and then awarded three incoming campus presidents substantial pay hikes. Sound familiar? The action provoked the Long Beach Press-Telegram to worry that the trustees should think about where all this is leading. The Press-Telegraph should worry. Long Beach State announced that it will no longer accept mid-year transfer students from California community colleges, along with Cal State Northridge and San Diego State. This ends the traditional route of hundreds of thousands of California students who, for financial or academic reasons, were unable to enroll directly in the CSU system. The CSU system also finally reached a contract with the California Faculty Association, which represents 23,000 professors, lecturers, and other professionals. A major proposal re-build the nation’s economy, restore living wages and pensions has been released from the Washington, DC-based Economic Policy Institute. Yale University’s Jacob Hacker and the Roosevelt Institute’s Nathaniel Loewentheil co-authored the report, which the AFL-CIO, Center for Community Change, the Leadership Conference on Civil and Human Rights, and the National Council of La Raza have said they’ll use to urge Congress to pass meaningful jobs legislation and other policies to benefit American workers.